Closed Since May 2007 Business.com works as a portal with primary own content. »Business.com, Inc. was founded in 1999 by Jake Winebaum, previously chairman of the Walt Disney Internet Group; and Sky Dayton, founder of Earthlink, Boingo Wireless, and Helio, among others. Around that time, the Business.com domain name was purchased from Marc Ostrofsky by Winebaum's eCompanies Ventures for a then record $7.5 million. This represented a tidy profit over the $150,000 price tag of the domain in 1997, also a record in its own time. In addition to investment by eCompanies, early funding in the amount of $61 million was provided in 2000 by Pearson PLC, Reed Business Information, McGraw Hill, and others. In its initial form, Business.com aimed to be the Internet's leading search engine for small business and corporate information. 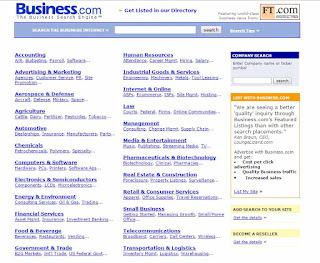 As with much of the nascent and well-hyped Internet industry, Business.com struggled through the Dot-com bubble years. The company retooled beginning in 2002 after massive layoffs and a new focus on developing a pay for performance ad network model. In April 2003, the company achieved profitability, and on November 8, 2004, having survived the collapse of the dot-com bubble, the company secured an additional $10 million in venture capital funding from Benchmark Capital. On October 9, 2006, Business.com launched Work.com, a site with business how-to guides contributed by the small business community. Then on July 26, 2007, after beating out Dow Jones & Company, the New York Times Company, IAC/InterActiveCorp, and News Corp, print and interactive marketing company R.H. Donnelley Corporation announced plans to acquire Business.com in a deal valued at $345 million. The deal closed on August 23, 2007. In June 2009, R.H. Donnelley filed for bankruptcy. The company emerged from Chapter 11 as Dex One Corporation on February 1, 2010.